Bali, eminently, is a popular destination for travellers looking for an unforgettable retreat. And clearly, it is the southern side that draws in the bulk of the province’s tourism – coastal areas like Kuta and Jimbaran are home to legendary waves, while the previously sleepy village of Canggu is steadily gaining popularity among hipsters and vegans for its edgier (and friskier) vibe. 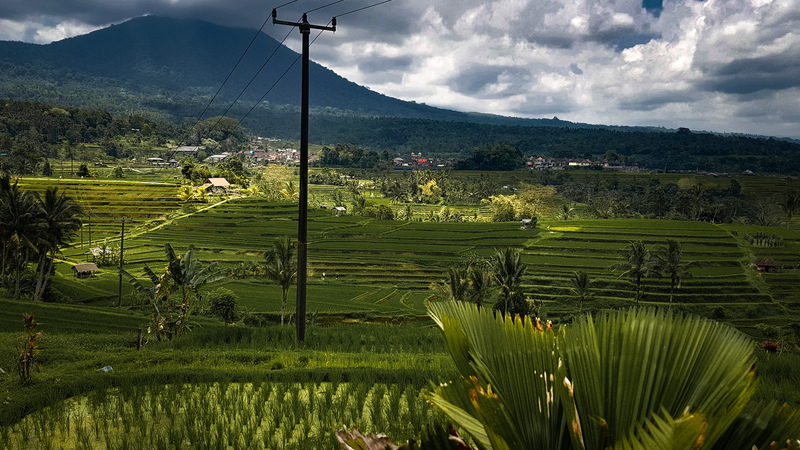 Ubud, on the other hand, has carved its name as a place for spiritual awakening. These places have never really made Bali appealing to me. My perception was given a complete overhaul this past September when I visited a village located within farmland on the slopes of Mount Batukaru, an extinct volcano and the second highest mountain in Bali, which is surrounded by dense rainforest. It was the exact retreat I was looking for, one where I could entertain my childhood fantasies of enchanted forests. Although there was no magic faraway tree or houses carved in trees, the place was otherworldly in its own right – considering that the jungles I come across day to day are made of concrete. During my first two days, I stayed in – surprise, surprise – an Airbnb accommodation in the form of a mountain cabin, hosted by Simon Evans, whom I had met while he was in Singapore. He was the person who unveiled to me this part of Bali that is unbeknownst to many, one that I now regard as the island’s best-kept secret. I was most impressed at the courage of this man who left a life in London – where he had been for ten years – to build a new one in unfamiliar, remote territory. Having lived in Bali for over eight years, he has successfully integrated with the villagers of his newfound home immersing himself in the Balinese culture while fluently speaking two of their primary languages: Bahasa Indonesia and Balinese. But it doesn’t end there. He has helped shape the village into a place of attraction for adventurous or nature-loving travellers looking for a hermitage away from the touristy areas. In turn, this has opened up employment opportunities and significantly improved the overall lives of the villagers. His staff are mainly men who are amiable (and cheeky! ), and during your stay, you will chance upon them cleaning, gardening and cooking from eight in the morning till dusk. It almost feels like you are part of the village. On my second evening, Simon invited me to meet his other guests, Ange and Esme, two lovely Australian ladies who had just arrived and checked in to their accommodation. Along with some of his staff, we sat at a communal hut, chatting away and drinking bottles of Bintang (for the uninitiated, that is the localised Heineken which can be found almost anywhere in Bali). Sessions like these open up the opportunity for Simon to improve the English of his staff, as well as elevate their social interaction skills – which is a heartening and inspiring sight to witness. 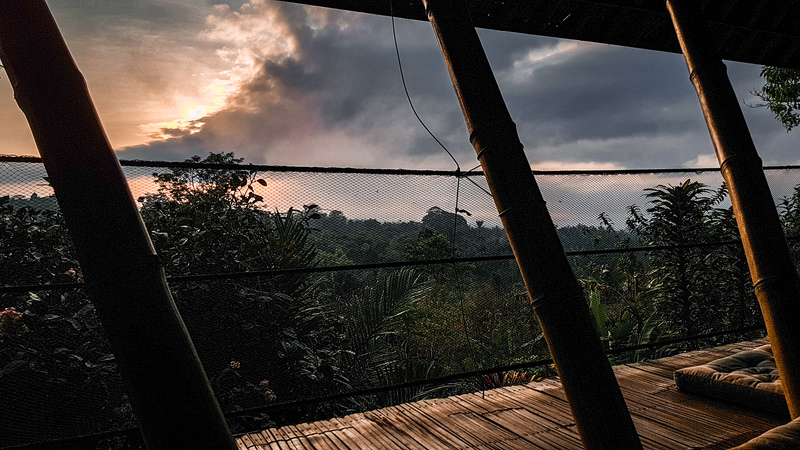 Third day in, I found myself in another one of his rental accommodations; a sustainable, open-air bamboo house spanning two storeys with an arresting view of Mount Agung on the horizon, which can be viewed from the bedroom upstairs. The home is complete with an open kitchen, where his staff would cook meals. At 150,000 Indonesian rupiah (about 10 U.S. dollars) for a person each day, guests enjoy three meals comprising local dishes using freshly-picked ingredients from the surrounding garden. These include dishes made up of chicken, tempeh or tofu, and vegetable, accompanied with sambals. Shortly after placing my backpack in the spacious house, I went on a jungle trek up to a temple with Ange, Esme, and Ana, one of Simon’s staff who became our guide throughout the journey. We were also in the good (paws) of Waluh and Jepang, two of Simon’s dogs who led the way up the trail. 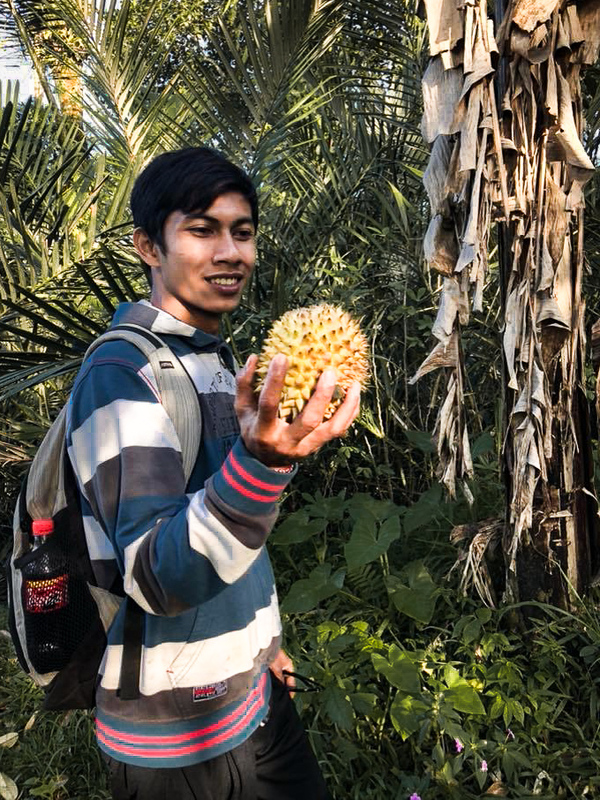 It was a breathtaking experience – no pun intended – to be climbing up the green corridor while absorbing the sights and ambient sounds that the natural landscape has to offer. Never in my life had I experienced such a state of serenity, losing track of time we took to get up to the temple. 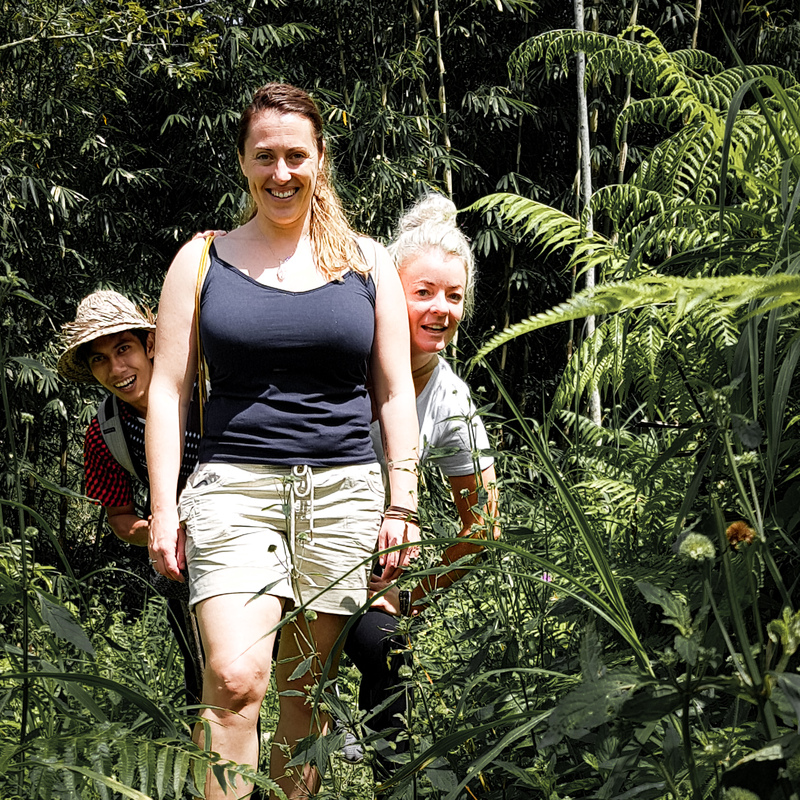 Jungle trekking is just one of the many activities this farm stay has to offer. Upon request, you could also choose to attend a wood-carving workshop, learn to cook local cuisine, expand your knowledge regarding Balinese Hinduism or rejuvenate yourself with a variety of massages. If you are keen to venture out and explore other parts of the Tabanan regency, you could take a trip down to the Jatiluwih Rice Terraces (entrance fee of Rp 40,000). The rice terrace is part of the Catur Angga Batukaru cultural landscape, a World Heritage Site inscribed by UNESCO in 2012 to preserve the Balinese subak system. The subak system has shaped the island’s traditional agricultural practices and is a manifestation of an ancient Balinese philosophy of Tri Hita Karana, or three sources of prosperity revolving around the interaction between spirit, man and nature. I visited the rice terrace that same day with everyone else to attend Festival Jatiluwih 2018. For the second year running, the festival aims to empower local communities beyond tourism, since the latter would not be able to run smoothly without the existence of a healthy community. Held at D’Uma Jatiluwih, Arts and Cultural Hill, locals and tourists gathered to watch a showcase of art and music performances aligning to this year’s theme, Matha Subak, displaying gratitude to God in hopes of transforming Jatiluwih into a sustainable tourist destination. Simon, Ana and I headed out the next day to explore the nearby attractions which included a trip down to the Sing Sing Angin waterfall. Unfortunately, our intentions for a quick dip did not happen as the water was too shallow. Regardless, I was absorbed in its charming glory. We then made our way to one of the beaches there, which had a coastline covered in alluring black sand – a result of past volcanic activity from Mount Batukaru. As the day faded into night, I could not help feeling a little melancholic at the thought of leaving the next day and resuming my hectic life. In a short span of five days, I established a connectedness with the place. I felt like I was ‘in my element’ – not even my ‘home’ in Singapore could provide that sort of feeling. For anyone who has ever detested Bali for its tourist-infested areas, I implore you to visit Mount Batukaru and the surrounding Tabanan areas, and if you do plan a trip there, I highly recommend Simon’s farmstay. For under Rp 700,000 (USD 48), you are paying not just for accommodation, but also an exceptional customer experience where the host would personally attend to you upon your arrival at his home, ensuring that you get the most out of your stay. This part of Bali will astound you with the lack of pretention, and a massive part of me hopes that it remains that way instead of turning into another bustling tourism destination infested with novelty attractions, night entertainment and places of interest that serve no purpose other than destroying the charming heritage of the are. Sometimes, less is more, and peace brings forth strength. Azryl Ali is a marketer, writer and aspiring entrepreneur. While he is a wizard at drafting communications for a construction firm in his day job, his free time is spent writing poems, studying human behaviours, and playing with pets that don't belong to him. His biggest goal in life is to help realise dreams and elevate the lives of other human beings - whether it is to rebuild communities, spark inspiration in others, or saving wildlife.